*This camp is a pit stop before the final boss. Fast travel is disabled, and you can't return here after beating the game. After speaking with Etzli in Skull Cave, a series of cutscenes carries the plot forward. Etzli and Uchu formulate a plan of attack, with help from Lara and Jonah. The main rebel force will approach the pyramid, where the ritual is to take place, via a bridge, while Lara sneaks in through a side entrance to act as a sniper. A bit later, when the group arrives at the place where Lara must leave the others, Etzli gives her part of the leader's amulet for luck. After today, he says, the eclipse will no longer represent his people; they'll keep the sun, but she'll remove the shadow. Lara accepts the gift, says a brief farewell to Jonah, then sets off on her own, diving into some sort of aqueduct. SWIMMING THROUGH THE AQUEDUCT: After the cutscene Unuratu's Amulet is added to the Artifacts section of your inventory, under The Resistance Story. Swim down and follow the flooded passageway to the northeast. The route is fairly straightforward, so I haven't included screenshots for most of it. There's one spot where you need to squeeze through some stone bars, and just beyond that is a pocket of trapped air. After this, things start to shake and boil. To quote a certain optimistic fish, just keep swimming. Continue through for the doorway at the bottom of the carved facade. (screenshot) Just beyond it there's another air pocket. Take a breath and continue through the collapsing passageway until you see light ahead. Follow the tunnel to the end and surface in a Yaaxil warren. When you move out onto the ledge, you get a wide-angle view of the huge cavern below the pyramid. As Lara watches, a Trinity helicopter destroys the bridge that the rebels plan to use. Jonah says they'll find another way around. Lara spots red smoke rising from one of the buildings ahead and tells Jonah she's going to investigate. Lara meets the Yaaxil leader, who she now understands is the Crimson Fire—Unuratu's counterpart, the Chak Chel to her Ix Chel. Lara manages to convince the other woman that she is capable of taking Unuratu's part in the ritual. The Crimson Fire gives Lara a mask symbolizing Ix Chel, and together they approach the temple. Follow the Crimson Fire down the steps and through the crowd of assembled Yaaxil. As you approach the circular door, a brief cutscene shows the Yaaxil leader ordering her people to open the door. When it's open, Lara and the Crimson Fire step through together. BEYOND THE FIRST CIRCULAR DOOR: At this point a new Artifact, a photo of The Crimson Fire, appears in your collection under Lara's Notebook. If you like, you can review it now for more information about the upcoming ritual. Lara then radios Jonah to say she's bringing reinforcements. She then overhears Rourke's men telling him they've spotted her with the Yaaxil. As you follow the Crimson Fire along the bridge to the next circular door, Lara tells Jonah they've cleared a path to the temple and Dominguez is inside. Approach the door to trigger the next cutscene. Inside the temple, Lara, the Crimson Fire, and a band of Yaaxil approach Dominguez, interrupting his entreaties to Kukulkan. Dominguez seems surprised to see them together. He insists that the ritual is his to complete and the Yaaxil have chosen the wrong side. Lara tells him he's the one who's mistaken; the ritual always belonged to the Yaaxil. All should have an equal part in remaking the world. But Dominguez is having none of this. As they all look up to see that totality is drawing near, he orders his men to attack as he escapes farther into the temple. NOTE: Even though many of the bodies glow in survival instinct, you can only actually search the 3 soldiers you just killed. They carry ammo, health, gold, and other minor resources. Rourke loses his cool and begins shooting frantically at the approaching Yaaxil. The Crimson Fire is not put off by a little machine gun fire. She leaps up onto the tank and shows him how her people deal with evil interlopers. NOTE: In my experience, if you take the time to run back and forth a few times, the right end of the wall starts to crumble, and Lara is more likely to miss the grapple point and fall. If you find a consistent tactic for this, I'd love to hear it. 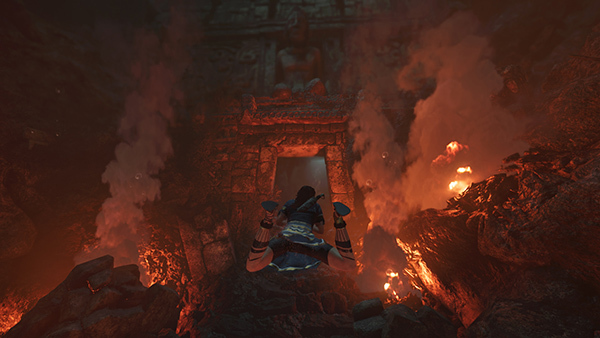 Lara arrives at the top of the pyramid in the middle of the ritual. She watches as Dominguez joins the Key and Silver Box, causing an incandescent energy to creep up his hand and arm, gradually taking over his entire body. Swirling energy then shoots from the dagger, energizing three stone statues positioned around the platform, and finally surrounding Dominguez in a glowing orb. Lara moves forward and takes cover in some bushes near one of the statues. DEFEATING DOMINGUEZ: First, here's an overview and some recommended tactics. We'll break it down further below. As the fight progresses, Eagle Archers and Serpent Guards will continue to spawn, but the main objective is Dominguez. He is invulnerable until you remove the protective orb. In order to do that, you must interrupt the energy flow by attacking the 3 statues. The first is just ahead on the left after the cutscene. The others are near the northeast and northwest corners of the platform. Once the orb is gone, Dominguez will be vulnerable. You'll need to shoot him until a smaller protective bubble appears around him, then run in close and melee attack him. Each time you do this, he grows more aggressive, but the fifth time he raises the bubble and you stab him, it's over. If you have unlocked the Heart of the Jaguar and Scales of the Serpent skills, and have enough herbs stockpiled, use Endurance and Focus mixtures right away and replenish them as soon as they start to run out. There's a mud puddle near the southwest corner. Even if you don't plan on using much stealth here, it's a good idea to apply camouflage. Then if things get rough, you can run away from enemies and hide near one of the many vine-covered walls. Dominguez will not be fooled, but this could buy a few moments to heal and/or take another dose of Endurance and Focus herbs. I'm sure you can find your own rhythm, but if you're consistently running out of ammo before the fight is over, try using the bow or pistol for archers, the shotgun and/or Puma's Feint/Dodge Counter against the Serpent Guards, and save most of your rifle ammo for Dominguez. There is more ammunition for all weapons lying around but not a lot, especially on the harder difficulty settings, so it's important not to waste it. You'll also find a few herbs, and you can loot dead enemies for supplies; however, the fight will go more quickly if you ignore most of the minor enemies, unless they are aggressively attacking you, and concentrate on Dominguez. If you can defeat him, the others don't matter. Here's one possible sequence. In a brief cutscene, he powers up and teleports across the platform, appearing directly in front of Lara. He swings his obsidian-edged blade and Lara dodges. Here we go! When you land the melee attack, another short cutscene plays: Lara and Dominguez struggle. She stabs him with her knife, and he shoves her away, but not before she grabs the dagger. This time Lara stabs Dominguez with the Key of Chak Chel, but one hit is not enough to finish him. This time when Lara stabs him with the dagger, Dominguez loses his majestic helmet, making him more vulnerable to headshots but much crankier too. You'll also notice the dagger transferring more energy from Dominguez into Lara, even as he boasts about becoming more powerful. Lara knifes Dominguez in the back. He elbows her in the face, throwing her off balance and stunning her momentarily. NOTE: If you're struggling with the boss fight, you're welcome to download my PC save file with Dominguez defeated. The ending then unfolds in a series of cutscenes. Lara gently, almost reverently, eases the dying Dominguez to the ground. She apologizes for having to take his life. He takes her hand and presses the dagger into it, entreating her to protect Paititi. Lara promises she will. The power of Kukulkan then consumes her and her vision fills with a blinding white light. Lara then experiences a vision of what life would have been like had both her parents survived. She looks at the dagger and imagines what Dominguez suggested, a world without weakness or cruelty. She remembers asking Jonah what he'd do with that kind of power. She lingers for just a few more moments in the idyllic vision, then wishes her parents goodbye and turns away. Back in Paititi once more, the Crimson Fire appears and guides Lara to the altar and helps her complete the ritual. As she plunges the dagger toward Lara's heart, instead of stabbing her, it surrounds Lara with swirling energy, then a brilliant golden glow. The eclipse passes totality and the edge of the sun reappears. Two days later.... Lara is back in Paititi with Jonah, Etzli, and Uchu at the conclusion of Unuratu's funeral. Lara whispers a final thank you to the queen, leaving behind her charm bracelet, with the eclipse medallion attached. As they leave, Jonah says he and Abby are planning a trip together. Lara wishes him well but says she wants to stay in Paititi a bit longer to help with the rebuilding and spend some time among the living. Etzli and Uchu join Lara and Jonah as they make their way down into the city, and all is well with the world. After the credits, there's a short epilogue. Lara is writing a letter to Jonah from her study back in Croft Manor. The house is restored, Lara has some artifacts from her recent adventures on display, and sunshine streams in through the open windows. Lara is in a much more lighthearted place now. She says she's not sure what the future has in store, but whatever adventure may come her way, she's ready to meet it. As she concludes her writing, Winston arrives with a tea tray. NOTE ON ALTERNATE ENDING: If you're interested in seeing an early, alternate post-credits scene referencing the original 1996 Tomb Raider antagonist, Jacqueline Natla, I've posted it here on YouTube. This article from Kotaku includes more information. POST-GAME EXPLORATION & NEW GAME PLUS: After the credits and epilogue, you are brought back to the Main Menu. If you select Continue, you'll return to Skull Cave in Paititi so you can continue to explore the world and go after any major collectibles you may have missed. Or, select New Game+ from the Main Menu. When you do this, you'll be prompted to import a save slot. You can then choose any save slot in which the story has been completed, including the Autosave. The next screen asks you to choose one of three 'Paths': Eagle (Seeker), Jaguar (Warrior), or Serpent (Scavenger). Each comes with 3 new skills, an outfit top and bottom, and a weapon. As you progress through NG+, you'll be able to unlock other advanced skills and gear, so don't worry about choosing "wrong," just pick whichever appeals to you. Then choose a save slot for your NG+ save and proceed. If you finished the game when it first came out and need a save file from which to launch NG+ or play downloadable content (DLC) packs, you can download my 100% PC save file, which has everything done on the Medium ("Rite of Passage") difficulty setting. Various other saves are available here. REVISITING THIS LEVEL LATER IN THE GAME: It is not possible to revisit the City of the Serpent once you've completed the game. There are no major collectibles here, other than the two artifacts you receive automatically as you progress, so it's not necessary. †UPDATE HISTORY: 1/20/19 - First draft of walkthrough posted online. 1/21/19 - Added notes on 100% and New Game+.